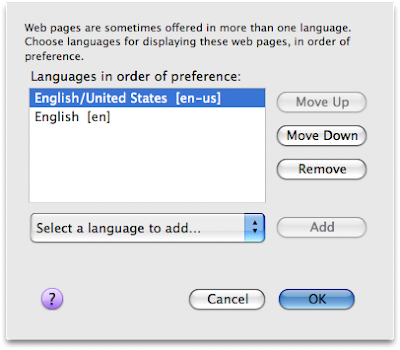 A New Mac Tip Every Day: Preferred language in Firefox 3! 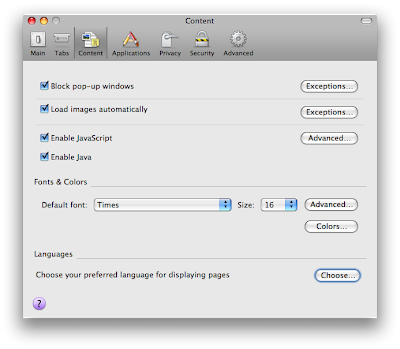 Preferred language in Firefox 3! In the case of websites that can be displayed in multiple languages, the browser will display the website in the language of the browser. With browsers like Firefox and Camino, it is in the language that you downloaded it. With Safari, it is based on the primary language of the OS. It has now slightly changed with Firefox 3. You can choose a list of languages in order of preferences and it is unaffected by the language of the browser. In fact, Firefox has always had this language list, and it simply defaults to the browser's language - the only thing that has changed is how to access it. For example, in Firefox 1.5 the respective button is on the options pane "Advanced". Cool tip, I'm loving Firefox 3 and am using it a my default even in beta. Any thoughts about bying tips4mac a domain. Its a little hard to remember plus it gets rid of that bar at the top of the screen. It is a great site and I think that would help out a lot because it would be easy for people to be told about it.